If you are familiar with me, you’ll know how much I love colour. My idea of hell is living in a bland, beige, neutral home. Not everyone is comfortable with my level of “colour” but pushing your boundaries and embracing bold colours needn’t be a scary thing. For the last few months I have been in the midst of house hunting and I’ve spent quite a bit of time after each property daydreaming about what colours I could introduce and which walls I would paint. 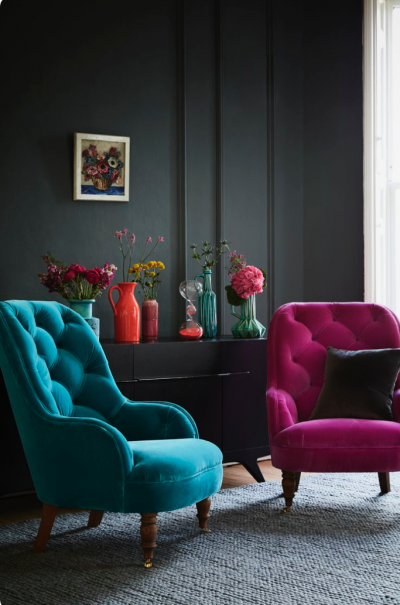 My idea of heaven is a room with dark walls (dark charcoals, inky blues) where all the furniture, artwork and accessories pop and stand out against the dark tone, like a kaleidoscope of colour. I love the feeling that bright colours evoke in me, it gets me excited. Here are some of my favourite interiors showing a great use of colour to inspire you to push your boundaries and embrace bold colours. This space is the perfect example of how a classic more traditional style interior can still be bold in its colour choices. This room has large windows which does allow for the dark walls. But even with a lack of natural light, these armchairs come alive against the dark background. Although this space carries major impact in the colour stakes, its actually a very simple space. The walls are white, the bedding is white and the bedside table too. 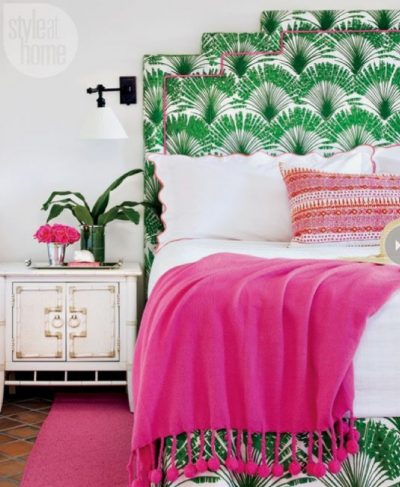 Its just the bedhead, the throw and the pink floor rug that makes the bedroom exciting. 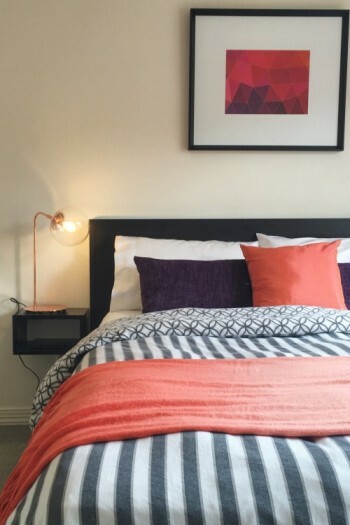 When considering adding colour into your home, even smaller items can carry big impact. Don’t feel pressured to change the big items (walls, sofas, flooring) you’ve got to build up your confidence. 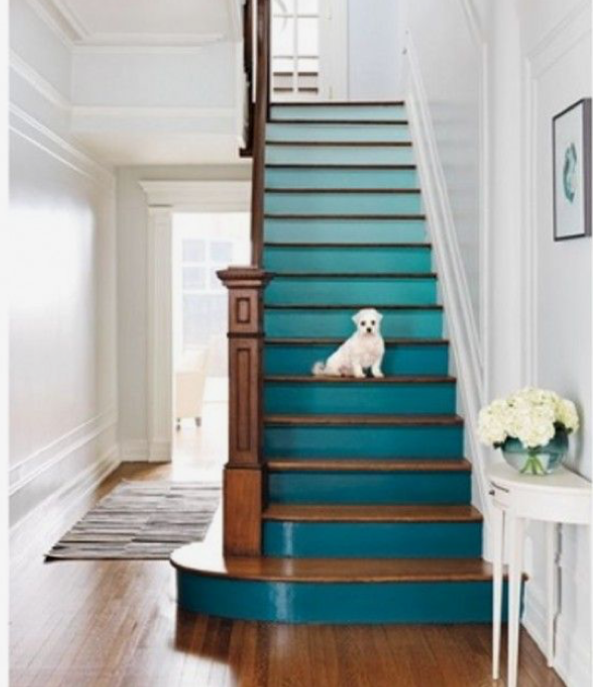 Stairs are an area of the home that often get overlooked when decorating. In actual fact though, they are the perfect area to have fun with as they give you lots of floor and wall space to work with. Case in point, how boring would this hall be without the teal paintwork? We often take for granted what happens on our ceiling. You might not even notice your ceiling as nine times out of ten, its plain, white and boring. It helps to have reasonably high ceilings, however I don’t think that is a deal breaker when considering an alternative to white for your ceiling. 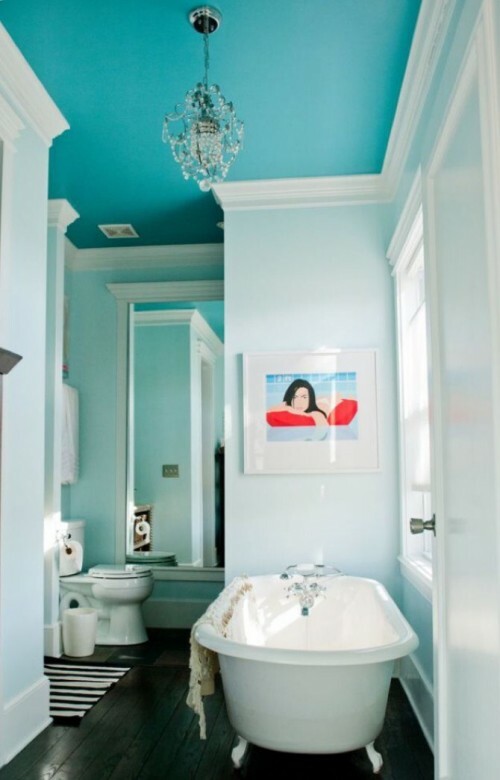 How dreamy is this blue ceilinged bathroom? The white walls lets the ceiling be the focal point. This approach would suit older properties with more prominent features present. The yellow and the ochre painted areas in this interior impacts the space without it looking too colour blocked due to their scale. They balance out the darker tones and the patterned tiles without screaming for attention. 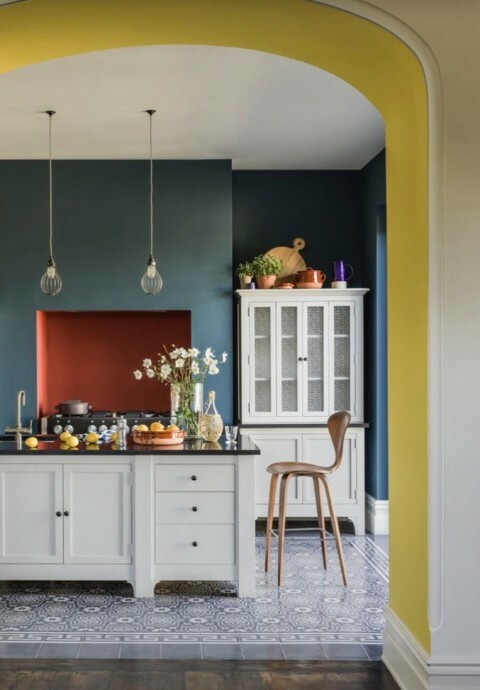 If you’re not convinced to try different colours in one space, consider using different strengths for different walls where the effect would still be fabulous.